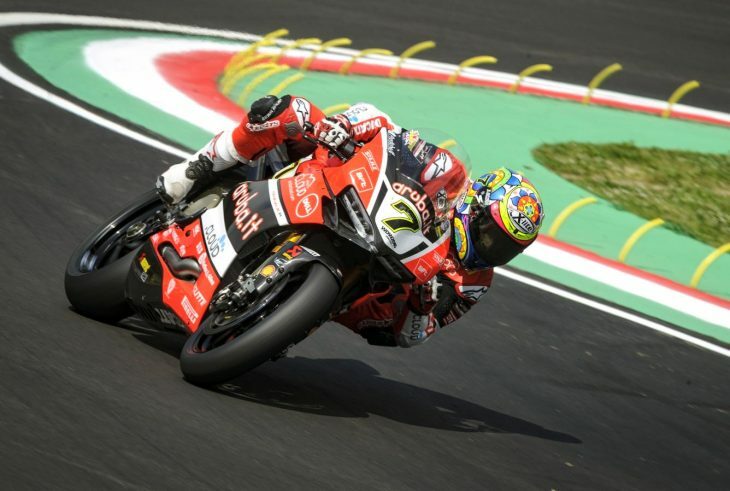 After shattering the lap record to take pole, Ducati’s Chaz Davies rode away from the two factory Kawasaki riders during Race 1 at Imola earlier today. Davies eventually won with a huge gap over the two Kawasaki pilots, who battled closely over second and third place. Jonathan Rea got the better of teammate Tom Sykes at the line. Rea has dominated the championship so far this year and has a 40 point lead going into Race 2 tomorrow. Follow this link for full results of Race 1, and stay tuned for our report on Race 2 tomorrow: Imola WSBK Race 1 Results. Damn I wish Nicky was on that bike. Even if he’s not as good as Chaz(?) he’d be a great teammate. Yup..lol. let’s do hope tomorrow’s race is more eventful..
That was one processional race! At the front, even Johnny Rea got bored and came up with a challenge all on his own (ran wide presumably just to tease his teammate). Back a few places it looked more interesting though I wish it wasn’t Nick who was overhauled. Yup. Not the excitement many WSBK fans have made it out to be for sure so far this season. We hear a lot of rhetoric here about how great WSBK is, and how lame MotoGP is. But notice after any given article about a WSBK race, there are about 10 or 12 comments. But after a GP, it’s not uncommon to reach 100+ comments. Seems to me, most of us are more interested in what goes on in MotoGP, whether we admit it or not. Both series have their moments, and both are sometimes a boring parade. That’s racing. That’s life. Davies shatters the lap record to qualify on pole? I thought they were slowing WSBK down. Lots of discussion a couple years ago when Dorna took over ownership of WSBK and announce cost reducing “EVO” rules. I guess I’m surprised it didn’t set them back more than 2 years.